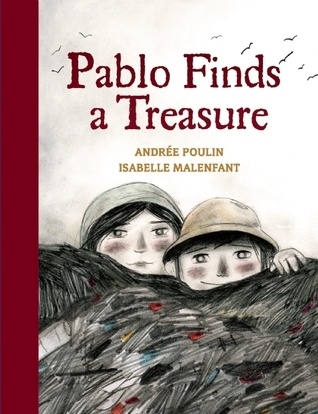 Summary: Pablo and his sister Sofia spend their days hunting for treasure on Treasure Mountain, the local dump. They’re joined by many other children who look for items that their parents can resell to buy a little food. Sometimes they find old food, and eat it quickly before someone can steal it. Their worst enemy is Filthy-Face, a man who bullies the children into handing over their treasures. On this particular day, Pablo is having trouble finding anything; Sofia is doing better and scolds him for overlooking bits of plastic that can be recycled. Just when he is ready to give up, Pablo finds a gold chain. He and his sister excitedly make a list of all the things they’d like to buy with the chain until suddenly Filthy-Face looms in front of them. He steals everything, and the two children have to run home empty-handed…until they arrive safely and Pablo reveals where he has hidden the gold chain. 32 pages; grades 1-4. Pros: An eye-opening look at poverty in an unnamed country. The gray-toned illustrations match the sober subject. This would make a good read-aloud to prompt further discussion or writing. Cons: It’s a pretty bleak story.